I tried a new recipe this past week from my latest issue of Everyday FOOD (April 2012). The cover recipe, Salmon and Spinach in Parchment. All four of us love salmon so I thought I'd give it a go. Overall, the prep was about 20 minutes. There are only 5 ingredients to shop for: baby spinach, oranges, salmon, fresh ginger, and shallots. Preheat oven to 400. Divide spinach among four, 16-inch long pieces of parchment paper. Top with orange slices, salmon, ginger and shallots. Season with salt and pepper and drizzle with oil. I substituted Citrus infused olive oil because I have it! Get your own Citrus Olive Oil from the Temecula Olive Oil Company. Don't fuss too much over your wrapping job. 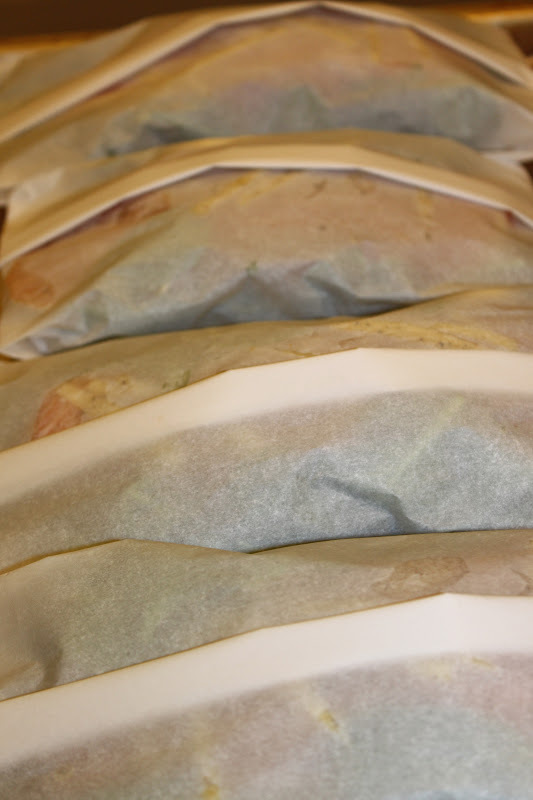 Do be sure to use parchment paper and NOT waxed paper. I served this up with creamy polenta. We all ate every bite--well, maybe not each piece of ginger. 1. I will use more spinach in the pouches or sauté some on the side. There was not enough to be considered a "side dish," which was how I envisioned it (based on the photos from the magazine). 2. I will grate the ginger. The matchsticks were a bit stringy and overpowered the other flavors when you had too big a piece in your bite. 3. I will make extra. The leftover salmon on a bed of fresh spinach would make a lovely salad (citrus vinaigrette) the following day. I was just looking at this same recipe and was doing a search for someone that's tried it. I was hoping to find out if these could be made in advance and put in the oven as company arrives. I really hate to do the prep when I'm trying to entertain at the same time. I'm just looking for a couple of hours lead time. : ) Whad'ya think? I think so, too. 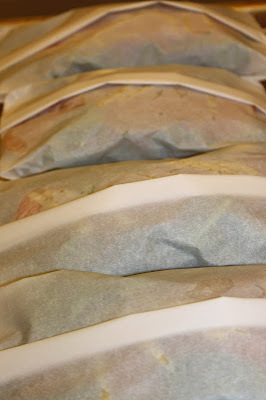 I'm going to look at other parchment paper recipes and see if it's noted anywhere. I'll be sure to let you know! Mahalo and Aloha!